On Wings of Eagles: Jesus is our Hedge of protection. Jesus is our Hedge of protection. On the island Skidaway in Savannah,Ga. 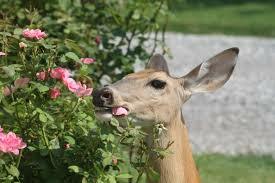 There is a small population of deer leisurely roaming the neighborhood, eating anything they choose along the way . Some homeowners have protected their favorite shrubs and flowers with wire or electric fencing which prevent the deer from stripping the plant. The deer In their eating spree would rob the roses of their beauty, sap the life out of them, and basically just consume them. Satan would like to do that to us Christian. He would enjoy stealing God’s beauty from our lives - the splendor of a spirit of giving, loving and serving. He would like to devour our lives by filling us with a spirit of greed, lust or fear. However, God puts a hedge of protection( Job 1:10) around His children, much as the homeowners protected their roses from the onslaught of the deer. He also has taught us how to dress ourselves with His armor; but mostly, He has allowed Jesus to shed His precious blood to cover us. God has promised in His Word that we will not fight Satan alone. Our heavenly father is our banner of protection. Dear Lord, thank You for being the hedge of protection around us. Help us not go outside the hedge where Satan can destroy us and our witness for You. In Jesus’ Name, Amen. Make the most of what God has given to you. Are you looking for God's hand print? God is watching over you. When we are weak God gives the strength. Conveyor belt is no problem for God. God is watching over us. A broken branch and God's protection. Are you using your gifts and talents?